I think you're misinterpreting. It's 1 dice per model in the Boingrot unit, not the target unit. A bit like Evocators, but happening after the charge move and not after the Evocators have fought (but Evocators roll 2 dice per model). The missing MONSTER keyword is a bit baffling to be honest. Has it been confirmed by the devs it's not just a mistake? Finally finished my Cursebreakers. Had a bit of a painter's lull and these took over a month to paint! They follow the same theme as the rest of my Sacrosanct Chamber (named "Celestial Crusaders" and using the Celestial Warbringers stormhost rules). What do you want from an AOS Skirmish update? I just want the AoS Skirmish to be more like Kill Team. So in essence modified activation order, command points and tactics cards. Some kind of lightweight campaign system is a bonus, even if I myself would probably mostly just play one-shot games. Grot sky pirates... oh dear. My wallet would never recover. Can I like your post 100 times? Sure, young people are needed, but when I look at the local club I hardly see any guys under twenty. There's so much stuff for a teenager to do today. Competition on their free time (and money!) is fierce. Anyhow. As a veteran wargamer who has seen a lot of weird stuff, even I thought the Enrapturess is a pretty sick model for a GW product Just look at it (from event photos as you can't do it on the store website). My guess is also the Enrapturess is too much for your average teen - not that teens play miniature wargames that much. About the box price, I too agree it should be ~20€ cheaper for what it contains. Considering the set can be used in both of their "big" games, GW could have easily priced it more aggressively as the volume surely would be there. Still no closeup or 360 for the Enrapturess. 95£ sounds pretty expensive to me. It's the same price as Soul Wars while containing less miniatures, no dice and no HC rulebooks. 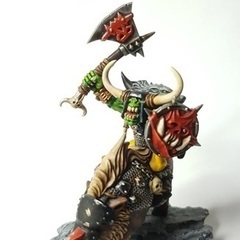 I've had some success using the Orruk Warboss with banner as a reliable Waaagh! 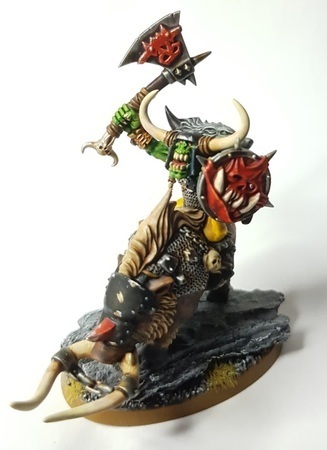 source, and a moonclan grot shaman as a replacement for the Weirdnob shaman. Good luck! Hate so say it, but you're gonna need it. IJ are in a tight spot overall, and at 1000 pts they're even harder to play effectively.